During my recent visit to Kota Bharu, Kelantan on the east coast of Peninsular Malaysia, I stayed at Hotel Perdana Kota Bharu, which is a 5-star hotel that has also received Certificate of Excellence by TripAdvisor.com reviewers. The following is my review of the hotel. 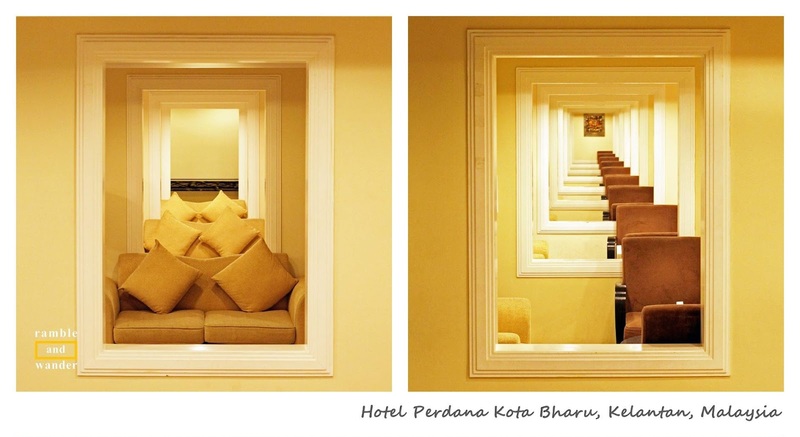 Hotel Perdana is a 5-star hotel located in the heart of Kota Bharu. It is one of the three hotels belonging to Malaysia’s PNB Group with the other two being PNB Darby Park in Kuala Lumpur and PNB Ilham Resort in Port Dickson, Negeri Sembilan. We arrived at the airport in Pengkalan Chepa early in the morning. The pick up from the hotel was there already waiting for us. Upon arrival at the hotel, we were assigned rooms almost immediately. The reception area is of medium size with the lobby having plenty of sofas and coffee tables for their guests to lounge while waiting either to check in or venture out into the town. Just next to the lobby is a unique seating area that has been designed to imitate a mirror image. The hotel has 272 rooms and suites in two blocks called wings. My room (a twin Perdana Executive room) was of above average in size and it's spacious enough for two people sharing, with plenty of space for luggage and stuff. It comes complete with a sofa with a small coffee table, two bedside tables, a work/dressing table and a wardrobe. The room also has a tea/ coffee making facility and an LCD TV apart from an electronic safe and a minibar. The mattress and bed are very comfortable. Linens and towels are okay. The bathroom is rather spacious too. All rooms are furnished with a modern luxury in a classic décor. Local artistes’ works are displayed prominently in each room. The corridors to the rooms and other waiting areas inside the hotel are also dotted with the same – paintings, wood carvings, silverworks, batik, and photos – in line with the hotel’s attempt to keep the local’s heritage alive while at the same time supporting local artistes. Overall, the room is well furnished and comfortable, and should be good whether for a business traveller or for a leisure stay. The hotel serves breakfast at one of their in-house restaurants, Cerana Coffee House. The selection is good, with options for both local and Western fares. The main attractions however are the local dishes like nasi dagang Kelantan, nasi kerabu, nasi kapit, and many others, which they make to perfection. The group that travelled with me all agreed that their nasi dagang Kelantan, which we had on our first day at the hotel is the best that everyone has ever tried. To read more about what to eat whilst in Kelantan, click here. Internet access is available for free via Wi-Fi at the hotel. You’d need to request for password from the reception. Like any other 5-star establishments, the hotel has a Business Centre, two swimming pools (one for adult and another for children) and also a gym that is opened to guests 24 hours a day. It also has a few in-house restaurants. Hotel Perdana has 5 restaurants and cafés, namely Cerana Coffee House (Western and local), Jade Restaurant (Chinese and Thai) and Eleven Restaurant (Mediterranean and fusion, on 11th floor) while Rebab Café (in the lobby area) and Anjung Terrace (by the pool) serve light snacks (cakes, pastries, etc.) and drinks. During the three-day stay at the hotel, I managed to try the food at Cerana Coffee House, Jade Restaurant and Eleven Restaurant. Overall, all the foods that I tried there were good but if I have to choose, personally I’d say that I like Cerana Coffee House the most for the variety of local delicacies served there. Jade Restaurant meanwhile is a close second. This is however not to say that the food at Eleven Restaurant is bad. It's just my personal preference when it comes to types of food. The view of Kota Bharu from above that you can see from Eleven Restaurant is pretty cool however. The best way to get to the hotel is probably by driving or using a taxi although if you’re already in Kota Bharu city centre, you probably can just walk there (See map below). With its location being in the city centre, Hotel Perdana is strategically located within the commercial district, shopping areas and local attractions, making it suitable for both business and leisure travellers. If you’d like to explore more of Kota Bharu – which I totally believe you should – you can join the hotel’s walking tour called Perdana Trail that brings you around the city on foot, exploring and learning about the culture, heritage and history of the city. You can refer to the reception for more information on this walking tour. To read more about Perdana Trail, click for Part 1 and Part 2. 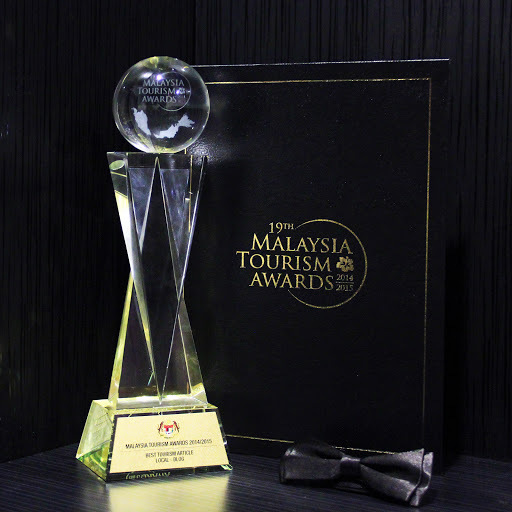 I would like to thank Hotel Perdana Kota Bharu and Destination Malaysia for the arrangement to stay at the hotel. The stay was sponsored as part of Perdana Trail programme. The sponsorship however has in no way affected my review of the hotel. Great article and nice place! Thanks, William. It's a nice hotel indeed & the stay was quite memorable! Sounds like a nice and comfy hotel! It is indeed. I did not mention it above but I love their bed & pillows! The breakfast looks delicious and the rooms are beautiful. Thanks for the useful review. I'll be sure to check out Hotel Perdana Kota Bharu next time I'm in Malaysia. Ha! Everybody in the group was "complaining" about breakfast! Why? Because we just had to have second helpings (or more!) from the buffet table. It was that good! It looks a very elegant hotel. Did the gym have any free weights, or just machines? It's quite elegant and you can see it's a five-star hotel the moment you step into the hotel. The staff are great too. Always wearing a smile & ready to serve you anytime. The gym does have free weights, they are on the right side of the room, which is why they don't appear in the photo. I like the fact that it is opened 24/7 to guests. Cool that they have local art on the walls! I stayed at a hotel that had art as well and it enhanced the experience for me ^_^ Nice review! Thanks! I love this kind of concept! All artworks that they have, whether in the lobby, corridors or in the rooms, are all unique and originals by local artistes, not just some cheap reprints. It was like walking into an art gallery, which in a way they are because they also sell some artworks on behalf of the local artistes' association. Looks like an awesome place to stay - and that breakfast looks incredible! Will definitely check out next time i'm in Malaysia. It was quite an awesome weekend stay. Great place, great staff & great food. Everyone in the group is still talking about it and how much everyone wants to go back there soon. Nice hotel! I like nasi dagang & nasi kerabu. Alamak! Sorry, not sure I missed your comment. Yup, quite a nice hotel, highly recommended! And I love their nasi dagang and nasi kerabu, along with a few other dishes! I love the pillow and the bed too! Camne boleh miss komen ni! Haha! But yes, the pillow and the bed! Kadang2 tu ingat nak buat room service je bila lapar, haha!